The architecture and scenery gives a feeling of incredible spirituality and, with its historic Christian sites, Rome makes an ideal place for the religious traveler. 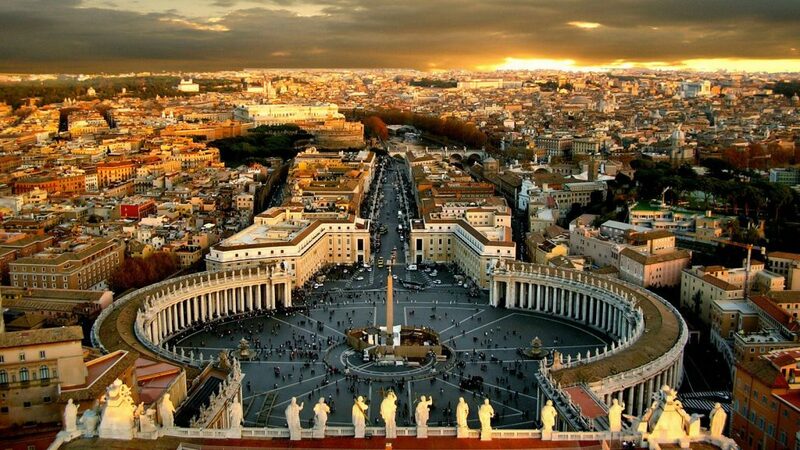 As soon as I set eyes on Rome, I was overcome with the beauty and splendor of the city. The architecture and scenery gives a feeling of incredible spirituality and, with its historic Christian sites, Rome makes an ideal place for the religious traveler. Dubbed the “Eternal City,” Rome dates back about 2,800 years. The city has been central to Christianity since the first century AD. As soon as I saw the large entrance gate to the Vatican Museums, I knew that there was a special spiritual experience coming my way. The Vatican Museums are home to the Sistine Chapel; artwork from Etruscan, Egyptian, Early Christian, Renaissance and modern periods; and the world’s largest collection of classical sculpture. Found at the north end are Pio-Clementino Museum, Etruscan Museum, Vatican Picture Gallery and Egyptian Museum. On the south end are the Borgia Apartments, Raphael Rooms and Sistine Chapel. The Borgia Apartments are home to Room V, featuring artworks done by Pinturicchio. The ceiling portrays the Legend of Isis and Osiris and the Bull Apis and on the window wall the Colosseum is shown in Martyrdom of St. Sebastian. The Raphael Rooms contain works painted by Raphael and other artists. The first Christian emperor, Constantine the Great, is featured in Room IV, referred to as Room of Constantine. In the Chapel of Nicholas V, frescoes depict St. Stephen and St. Lawrence’s lives and martyrdoms. Room III includes Raphael’s The Expulsion of Heliodorus from the Temple at Jerusalem and Liberation of St. Peter. Room II is the location where letters were signed by popes. The room includes several works by Raphael, such as a wall showing School of Athens, portraits of Renaissance artists and the painting Triumph of Theology. In Room I, paintings show aspects of Leo X’s life. The ceiling depicts Glorification of the Holy Trinity, done by Raphael’s master, Perugino. On the way to the Sistine Chapel is the Gallery of Maps, named after the 40 frescoed maps on its walls. The maps denote papal properties during the time of Pope Gregory XIII and Italy’s regions. I instantly noticed the details of the golden ceiling in the Gallery of Maps. It is easy to become caught up in the beauty of the ceiling and fail to notice the rest of the room. The Sistine Chapel is one of the world’s great art treasures and truly an extraordinary experience with its vivid wall and ceiling frescoes. See Michelangelo’s artwork, including The Last Judgment, the largest fresco of the 16th century, on the altar wall and chapel ceiling, where nine stories from Genesis are portrayed. The chapel’s side walls are filled with Renaissance frescoes of biblical scenes and popes, done by other artists. The chapel conveys papal authority and is the site where papal elections in the conclave are still conducted. Entering St. Peter’s Square is quite breathtaking with its magnificent architecture and two fountains. An obelisk, a long pillar with pyramid-shaped top, stands in the square’s center. The square has 140 statues of saints standing on the roof of the colonnade, a series of columns. Statues of Peter and Paul, Rome’s patron saints, appear near the basilica’s steps. St. Peter’s Basilica occupies the site where Peter, the apostle regarded as the first pope, was crucified and buried. His tomb is beneath the main altar; a number of other popes are also buried at the basilica. 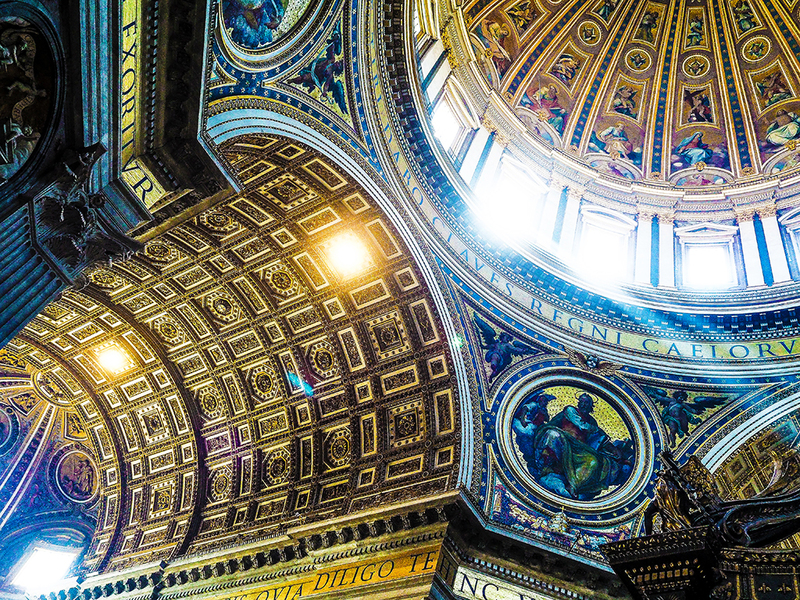 Several Renaissance masters, including Michelangelo, Bernini and Bramante, rebuilt the basilica in the 16th century. The huge dome was created by Michelangelo. Inside the basilica’s nave, see where Charlemagne and Holy Roman Emperors knelt, at the round porphyry slab, during their coronation. In the nave are 39 statues of saints who founded religious orders. The baldacchino, constructed of about 927 tons of dark bronze and about 100 tall, protects the papal altar and St. Peter’s holy relics. The Confessio chapel was named because of St. Peter’s confession, which led to his martyrdom. The Confessio is found at the base of the baldacchino. Four piers support the baldacchino and each one has a niche with a statue of a saint to represent the basilica’s four major relics. The saints are St. Helena, St. Longinus, St. Andrew and St. Veronica. St. Helena was Constantine’s mother and she holds a cross. The relic is the representation of the True Cross discovered in Jerusalem by a saint. St. Longinus was a Roman soldier who pushed a spear into Christ’s side during the Crucifixion and eventually became a martyr after he converted. The spear is the relic. St. Andrew was martyred on his diagonal cross and the relic is his head. St. Veronica’s relic is the veil used by Christ to wipe his face en route to Cavalry. The relics are only displayed during Holy Week. There was so much to take in that sometimes I didn’t know where to begin looking, but I wanted to absorb every detail from this once-in-a-lifetime visit to the Vatican. I took many photos to remember all the details. Rome, itself full of architectural and spiritual wonders, is a city that I could return to again and again.